Color Dust Jacket Tarzan strides forward carrying what appears to be an English long-bow. He is in the process of knocking another long, broad-tipped arrow. Two uniformed soldiers lie in the foreground pierced by previous shots. 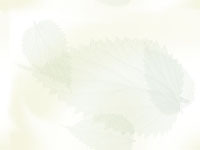 Tarzan is thin and muscular, and he is wearing his famous rope slung around his right shoulder and under his left arm. There is a quiver of widely fletched arrows on his back. The scene is steeply mountainous with a palm tree at the lower right. The sky is an eerie yellowish green which contrasts well with the broadly brushed red strokes of the TARZAN in the title. 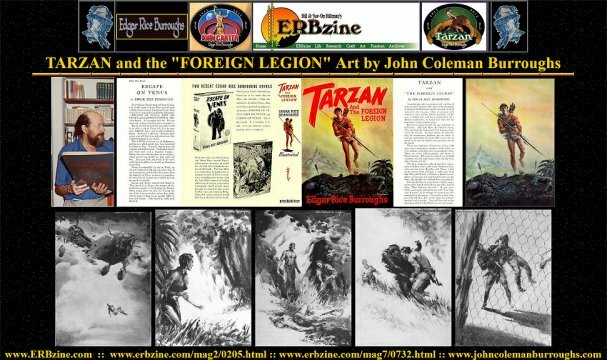 Despite some slight misgivings about Tarzan’s precise balance - - the pose is a bit stiff and awkward like a clay figure stuck on a sculptor’s stand - - the picture is dramatic and engages the viewer directly with great force. 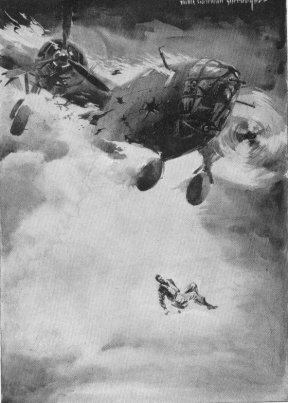 A flaming bomber with one propeller still madly whirling tears across the top of the picture, while a tiny airman who has just bailed out drops into the clouds below. The plane rages, while the man calmly falls almost sitting back on the easy chair of the fluffy white. It’s an odd contrast of moods. A large-breasted woman in a tight-fitting dress appears from the jungle on the left. She is in the process of turning toward a tiger that walks toward her from the right. A large patch of white sunlight pours down from the upper left to outline the woman’s head and illuminate the tiger’s face. Tarzan (wearing an aviator's helmet!) stands over a dead Japanese soldier. 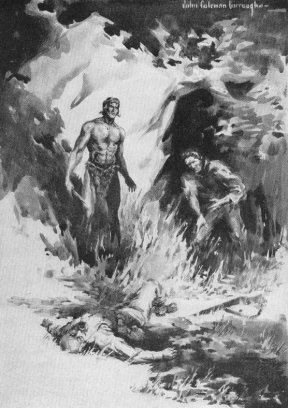 Tarzan holds a knife in his right hand at his side. Another aviator stands at Tarzan's left, leaning forward with his right hand on his right thigh. 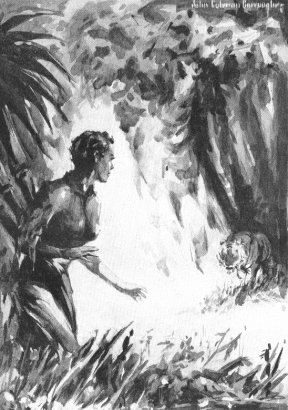 His left hand with spread fingers echoes Tarzan's own left hand. Greco's tortured skies. The Tarzan figure and the composition in general is very fine, an outstanding work by JCB. Tarzan struggles with a very large orangutan in the center of the picture. 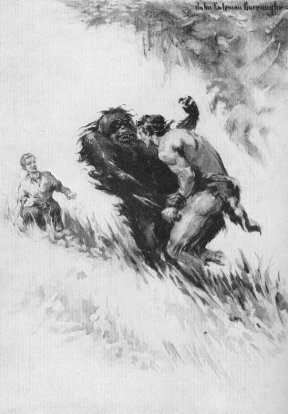 Oju holds Tarzan’s left wrist to prevent a blow from the hunting knife. A white woman crouches to the left of the scene with a rather serene look upon her face. The battle takes place upon a steep hill that rises to the left of the picture. Tall grass and trees above draw the action upward as does the orangutan, who leans backwards. It is is extremely powerful picture, well conceived and executed. 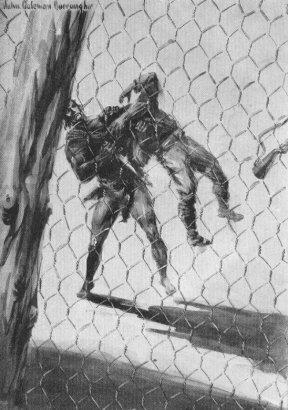 In a tour de force illustration observed through a wire-mesh fence 3 or 4 feet from the viewer’s eyes, Tarzan throttles a Japanese soldier with his left arm while preparing to strike with his flashing knife. A large fence post slants on the left, while the guard’s rifle flies through the air disappearing off the picture to the right. The small Japanese soldier is lifted entirely off the ground by Tarzan, a very dramatic, and savage, drawing. but the prize winners are the dust jacket and the fight with the orangutan. For much more on this book see ERBzine C.H.A.S.E.R.